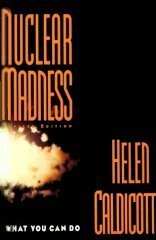 Nuclear Madness - Helen Caldicott, M.D. “As a physician, I contend that nuclear technology threatens life on our planet with extinction. If present trends continue, the air we breathe, the food we eat, and the water we drink will soon be contaminated with enough radioactive pollutants to pose a potential health hazard far greater than any plague humanity has ever experienced,” says Dr. Helen Caldicott in Nuclear Madness. In this completely revised, updated, and expanded edition of her classic book, Caldicott defines the dangers of nuclear power, discusses the insidious influence of the nuclear power industry and the American government’s complicity in medical “experiments” using nuclear material, and calls on us to accept the moral challenge to fight against it, both for our own sake and for that of future generations. The disaster at Chernobyl and the “incidents” at other plants around the world have disproven the image of “safe” nuclear power, and developing nuclear technology in the Third World poses still further risks. Pingback: Entomological Philosophy » Blog Archive » Talk by Dr. Helen Caldicott inSanta Barbara, 3.24.12.